There are certain images from horror movies that will stay in my mind forever. The first time Chucky spoke in Child’s Play, the scene in The Sentinel when Alison's dead father casually passes through a dark room, the opening of the original When a Stranger Calls, the lake scene in Let’s Scare Jessica To Death and Michael Myers hacking his way through a closet door while the light bulb flickers on and off in Halloween—just to name a few. These scenes succeeded in being creepy and shocking not because of the subject material but because of how simply they were delivered. In an age where audiences rely on screams and loud crescendos to tell them that they should be scared, there are still a few out there that use realism and minimalist film tactics to make that point. 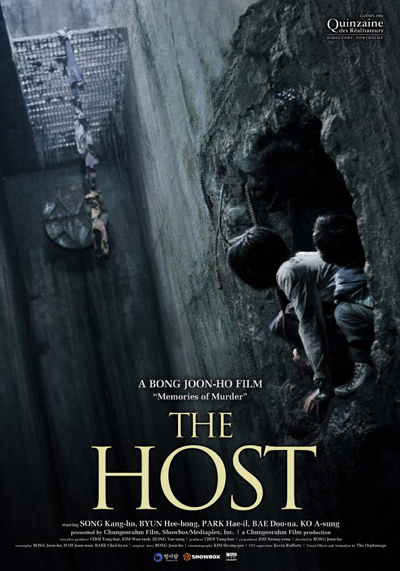 After watching Joon-Ho Bong’s The Host, I proudly add the already infamous "park scene" to that list. 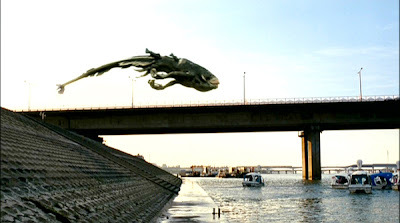 The film opens in 2000, when a US military officer orders a Korean subordinate to empty countless bottles of formaldehyde into the sewage system, even though the subordinate protests that it leads directly into Korea’s Han River. The film passes through the years and we see how the formaldehyde has casually mutated some of the underwater life. Finally, we’re in modern times where we meet Park Hie-bong and his son Park Gang-Du who operate a small food/news stand right on the Han River. Hie-bong is a charismatic and hard working old man while Gang-Du is a bit of a slacker. He sleeps at the register, screws up food orders, and even sends his unemployed college-graduate brother to his own daughter’s Career Day. After school, his daughter, Hyun-seo, comes to the stand to watch her aunt’s archery match on television. While Gang-Du is bringing an order to a customer, his attention is focused to the bridge over the Han River where everyone seems to be looking. Hanging from the bridge is a large, slick looking creature, slinging by his large tail. Everyone assumes it’s a hoax until the creature dives into the water and heads toward the land. And from this moment on, the rest of the film is celluloid history. 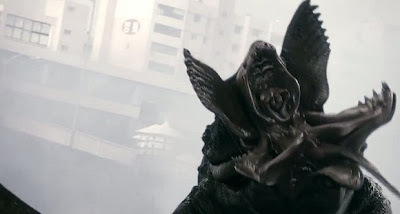 The revelation of the monster comes so quietly and swiftly that it’s nearly impossible in my mind for you to watch it without widening your eyes or dropping your jaw. The monster rampages in the aforementioned park scene, taking no prisoners. Gang-Du, with the help of an American soldier on vacation tries to take down the monster with little success. 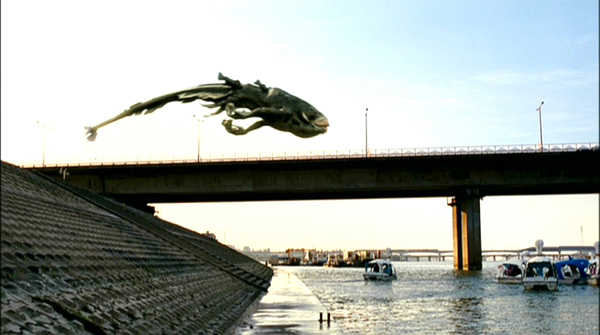 Making a quick exit, the creature snatches Hyun-seo and dives back into the river. After mourning their loss, the Park family is forced to a hospital because a rumor is spreading about a virus that stems from contact with the creature. While being treated (horribly nonetheless) in the hospital, Gang-Du receives a call from his daughter indicating that she’s still alive and stuck in a giant sewer. With this newfound hope, the Parks set aside their differences and band together as a family to reclaim one of their own. Typically I’m not a huge fan of "monster movies." I’ve never enjoyed giant creatures walking around eating people and knocking over buildings. Somehow The Host has made me think that I may have been wrong all of this time. Despite a horrible fear of sea creatures (I could never pass level 2 on Super Ghouls and Ghosts because I refused to fight the sea creature boss) The Host has the most believable monster I have ever seen. Watching it perform was like watching a ballerina dance. There were brains, human qualities, and movements behind every inch of motion that the creature used. And to imagine that it was CGI. The creature in this film was far more convincing than any of the CGI dinosaurs in Peter Jackson’s King Kong and on far less of a budget. Watching this beast lunge and dangle from bridge to bridge was like watching Pamela Anderson’s chest when I was thirteen. I knew it was fake, but I was nearly convinced it was real. What surprised me most about this movie was its sense of humor. Though this film isn’t exactly a roll-on-the-floor-laughing sort of flick, its use of simple and sometimes offbeat humor gave the characters and story a diverse mood that other horror features would have exploited or misplaced. The acting is quite convincing, especially on the part of Gang-Du (Kang-Ho Song). His character’s mood shifts frequently in the film but Song moves through them in strides. What also makes the viewer more attached is the film's grounded convictions on family and loyalty. This Park family isn’t exactly the most popular neighbor on the block, but when it comes to the danger of one of their members, it appears as if it is an unspoken bond in which they know what they have to do. Similar to Pan’s Labyrinth, the film doesn’t end exactly how you would expect. There are also hints of social commentary regarding the war in Iraq and war in general. Thankfully these messages are carefully hidden in the story and are never forced down our throats. The Host is an exemplary act of Korean cinema’s brilliance and proof that when it comes to making films that defy genre and give audiences layered stories with a message; they are the current heartbeat of Asian Cinema. Just look at the Park family. In a movie where violence and despair surround the characters, there’s still heart and an unbroken bond that carries the film until the end. We should all be so lucky.